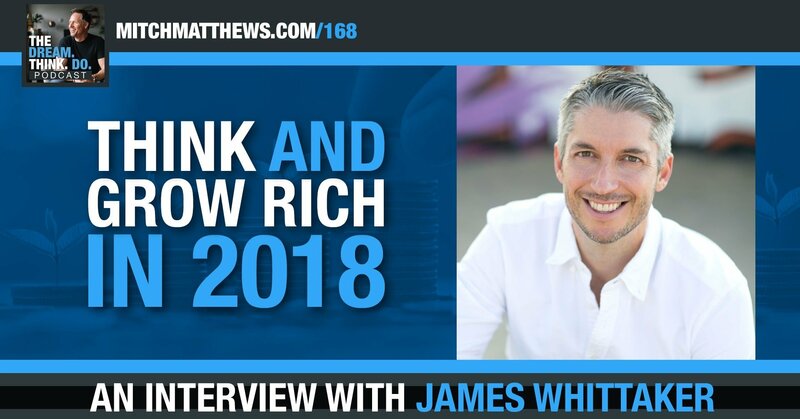 Mitch interviews successful author and entrepreneur, James Whittaker. With Napoleon Hill’s ‘Think and Grow Rich’ principles in mind, James interviewed successful entrepreneurs, thought-leaders and athletes like: Grant Cardone (property magnate), Barbara Corcoran (VC and star of ‘Shark Tank’) Rob Dyrdek (Skateboarder and millionaire business mogul), Warren Moon (first African-American quarterback to be inducted into the Pro Football Hall of Fame), Ocean Ramsey (global shark conservationist) and many others. Whittaker and his team took their findings and created ‘Think and Grow Rich The Legacy’ – A feature-length docudrama and new book. Mitch talked with him about what he’s learned and how to apply these powerful concepts… today. I love James Whittaker’s story. He loved Napoleon Hill’s classic book, ‘Think and Grow Rich.’ That’s not a big surprise. This book has sold well over 100 million copies and has been a world-wide phenomenon. But James and his team decided it was time to update this classic and make it more accessible and applicable for our era. Armed with Hill’s principles, James interviewed successful entrepreneurs, thought-leaders and athletes from around the globe. Plus, he and his team dug in even deeper into the stories behind Napoleon’s original interviewees. Their findings are fascinating, powerful and refreshingly simple! Listen in. You’ll be glad you did. Also, be sure to leave a comment and let me know what stood out to you. Was it a story? A strategy? That awesome accent? What was it. Let me know. I can’t wait to hear from you. Great interview James. Thanks for sharing the story and continuing Napoleon Hill’s body of work! Congrats all round. Get the full audio version of Mitch's book and the IGNITE ACTION GUIDE for FREE! From corporations, associations and non-profits, to colleges and universities - Mitch Matthews combines powerful stories and implementable strategies with a stand-up comedy style delivery to give your audience a once-in-a-life-time experience! He's a results-oriented keynote speaker that your people will THANK YOU for bringing in! Unlock 10 keys to living your best life! No spam, ever. Your info is never shared.